The report builder allows you to create a custom report using content from the Indiana Indicators Dashboard. Report editing does not require an account. Changes are automatically saved. As long as the browser is left open, the report will be available for editing for up to 12 hours. To start, click on the open report builder link above. This will open the interface in a new window (or tab). If the window does not open, it may be blocked by a popup blocker. Refer to the documentation for the popup blocker for details on how to prevent this. Users can also right click on the link and indicate 'Open link in new window'. The report builder has 2 main components. The build area (A) is the part of the screen where content is added. The component dock (B) is a set of panels that contain content and containers that are added to the report. Drag a container (one of the icons with gray squares) from the dock into the build area. As you drag over the the build area, you will see part of the screen highlighted. Highlighted areas are places where a container can be dropped. Containers create structure for the report. At least one container is required, but you may add others as needed. Once you have at least one container added, you are able to add content components. To select a component, click on the component tab of the component dock. You will see a list of components that can be added to the report. To add these to a container, drag them over to the build area until you see a highlight on the screen indicating where the component may be dropped. Components have default values to start. 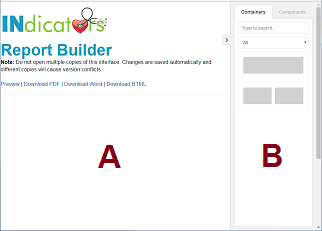 To set the desired value for a component, mouse over the component in the build area until a gear icon appears in the upper left hand side of the component. Click on the gear icon to bring up editing options in the component dock. Options vary by component. To move a container, click on the container. This will bring up a small menu on the upper left corner of the container. Click and drag over the arrow icon to move the container. Click on the 'X' icon to remove the container. Click on the copy icon to make a copy of the container. You can mouse over the components to access similar functions. Heading: This is a title for the document. Only a limited range of options are available through this interface. To customize further, download a word or HTML version of the report. Images: Select from the available clip art. Currently there are images available for 'Education and Employment' or 'Health and Wellness'. Saved Items: This provides a dropdown listing items that were saved from other parts of the site. Dashboard: Drag this over to include a badge from the dashboard. Users can select geography and topic. Page Break: This inserts a break in the content. This is primarily useful for the PDF output of a report. PDF: This is a quick way to get a shareable report. Word: Download a report for further editing or sharing.